Each year about this time, we sit back and look at the growing season; what worked and what didn’t, as well as what could stand some improvement. We also consider the challenges we may face in the next growing season. Some things like weather and pests are give ins each year, but other large issues that only surface once in a while for a grower - and how they’re approached- will determine your level of success that season. A varied list of challenges await all farmers each growing season and to assess them now, and come up with a thought-out plan of approach, will hopefully lessen the effects of these issues in the busy Spring planting season ahead. I’ve outlined below some challenges we faced in the 2013 growing season and how we plan on overcoming these issues in the upcoming year. This was a big issue in 2013. A part of this was getting our compost and fertilizers delivered and spread on time; supply problems you could say. For compost, we had four suppliers and of these four suppliers one had weed issues, one had rocks in the compost, and one had delivery problems. The fourth was the most expensive, but they have an excellent product and their delivery schedule is second to none. If I needed 300 yards for Monday morning, when I got to work on Monday there would be six 50-yard trailer dumps waiting to unload. The best product and best service gets my vote. All of our compost for 2014 has been delivered and will be ready to spread when we are next spring. 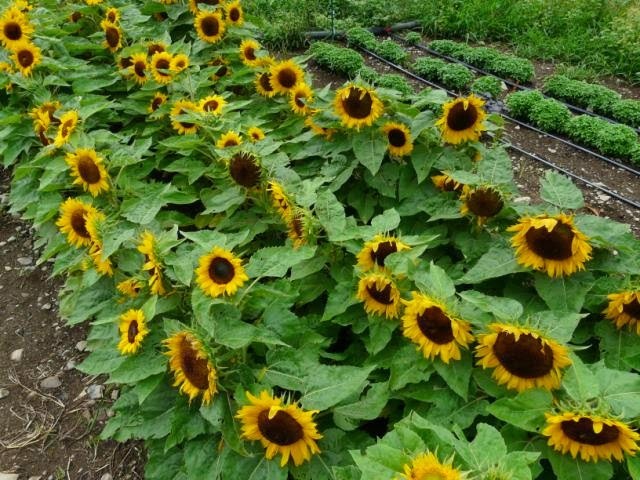 We use pelletized chicken manure for our organic fertilizer. We have been purchasing from a company which also spreads the product. With our dry, then wet Spring, we had many problems getting our fertilizer spread in time to do our fieldwork. In early May, when the field conditions were fairly dry, the supplier first couldn’t get the product and then didn’t have time to spread it before the heavy rains arrived. When everything else finally cooperated, the spreader truck was out of commission. The end of May found us scrambling to fertilize, prepare the soil, lay the plastic, and plant all in a rather frenzied procession. For 2014, we purchased our own new fertilizer spreader which holds four tons (our old one held 600 pounds). I will order our soil amendments (based on soil test results) this month so we’ll have them on hand come February 15th. The advantages of this include having adequate supplies on hand, being able to spread in that early season window if we have one, not having to worry about the roads being weight posted, and lastly, being able to haul 4 tons of material instead of 600 pounds. Loading one- ton bags will be faster and easier than using 50 pounders too. Four tons will cover eight acres so many fields can be spread with one load instead of many. Weeds are a constant challenge in any farming system. In our squash and pumpkin trials and nurseries, we like to leave a bed between planted beds so it’s easier to trace the vines for accuracy in determining which fruit go with which vine. This amounts to approximately ten feet of space between the strips of plastic in which weeds like to grow. Weed control while the plants are small is relatively easy; it’s once the vines come out into the open and are between the beds that weed control becomes difficult. The vines make it nearly impossible to mechanically cultivate the areas with weeds. A few years back, we started using hay mulch for weed control; a good idea but fraught with drawbacks. The labor it takes to roll out and spread 350 large round bales of hay is a tremendous amount. To put in perspective, it takes approximately 320 hours. The thickness at which it rolls out varies with how the hay was baled and what type of grass it was. A thin grass, like annual bluegrass, rolls out to a 3-4 inch depth whereas a swale grass can be a foot thick. Therefore, the bale may cover two hundred feet, or it may cover only fifty. This year we purchased a straw shredder which unrolls and shreds the bales before spreading them onto the field. We took delivery of this unit last month and did some testing in the field to try it out. It will put down a uniform layer of hay mulch to four hundred linear feet twelve feet wide. Two people should easily be able to spread 3 acres a day; therefore all of the work will be finished in less than three days. Another success from 2013 was widening out the rows of crops on plastic that have row covers on them. 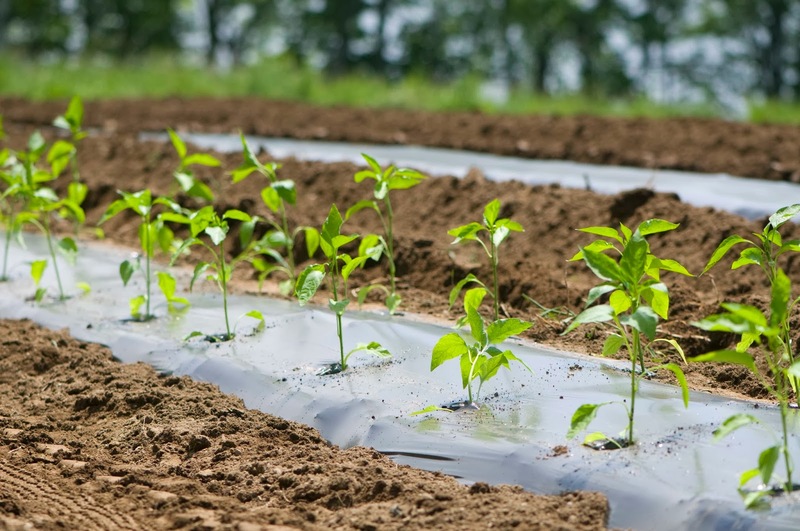 We cover our peppers to prevent cross pollination and to give the plants some protection from the harsh Spring elements. We use wire hoops to keep the row covers up off the plants, however. This also prevents us from cultivating the peppers as we don’t have a tractor tall enough to straddle the covered rows. 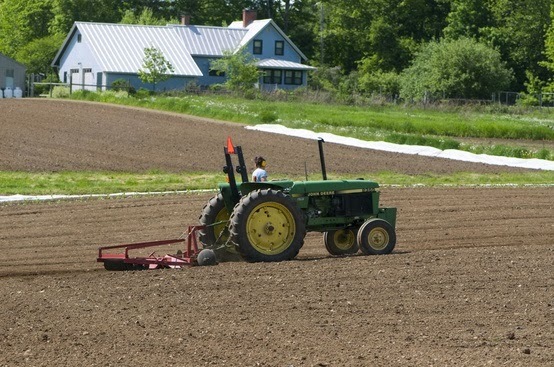 By spacing out the rows to allow us to go between them with our smallest tractor, as well as a four foot tiller, we can now cultivate out the weeds all season long. It uses a bit more room this way but saves a tremendous amount of hand labor, which we can always use somewhere else. We’ve used this spacing for years in our tomatoes to facilitate equipment for spraying so the setup was easy to figure out. This allows more crops with wider spacing for next year; at least the ones with row covers. You can almost never have enough good land to have a good rotation plan. If we had 35% more land than we need in any given year, think how much we could put into cover crops and devote to rotation plans. Last year I added a twelve-acre field and this year I added seventeen more. I think that’s good for a while. We’ve got a couple of small land projects that will add another four acres of good soil. Many of our fields need work to become productive again so this is where we’ll focus some of our attention in the upcoming years. We added a couple thousand feet of drain tile this year and have some stumping to do next year, so it looks like we’ll be busy in 2014 too. Farming is always busy! No, I can’t control the weather. All we can do is prepare for the worst and enjoy the best. We do everything we can in the previous Fall so we don’t have to do it in the Spring. Two years running we’ve been on the fields earlier than ever before, and then we got constant rains which put us behind. Once you get behind, it’s pretty hard to catch up and stay caught up. This year we’re implementing a seven day work week schedule. No, not seven days in a row but rather spreading out the work to seven days instead of five. It’s just too hard to schedule the same two days a week off for everyone. We work hard all week then everything stops for two days then we’re back at it for another round on Monday. I realize not everyone wants to work only on sunny days and have rainy days off. Me neither, but I do want to get the work done, and if we have the optimum weather conditions and it just happens to be a weekend- we’re going to work. And, if we get heavy rains during planting season, I know we have done everything possible to get the crops planted correctly and on time. At all costs, try to be ready for Spring long before it gets here. Lastly, one final thing I think will make a big difference to the folks working on the farm, is for me to spend more time in the field and less in the office. I like being in the field; that’s where I started. I can do everything here that needs to be done, and more importantly I can train folks how to do the tasks we need to do. I researched most of the equipment here; in fact I bought most of it, and know how best to use it to achieve the results we’re looking for. I know the funny little nuances and quirks of the equipment and tractors. I know how to cultivate and plow and spread compost and so on. I also know how I want it done. I want it done to the same high standards we do everything here at Johnny’s. I’m sure the farm crew will enjoy more of my presence in the field in 2014. Labels: Albion Maine, at home, compost, Garden tech, harvest, Maine, New England, Organic Vegetables, vegetables, What's New at the Farm, What's new at the farm?